The UCLA Center for Health Policy Research creates and disseminates various reports on the health of California’s diverse population. 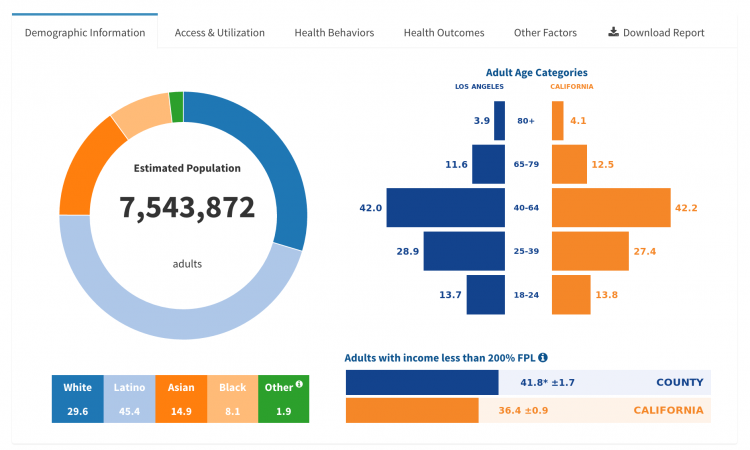 By leveraging R, Shiny, and Shiny Server, as well as a plethora of data visualization packages, I developed a dashboard that presents health information in intuitive and user-friendly ways. This dashboard also allows users to download data in a user-friendly PDF format. The dashboard is available here. On an annual basis, researchers at the UCLA Center for Health Policy Research create the Elder Index, an evidence-based indicator of the actual costs faced by older adults in California. 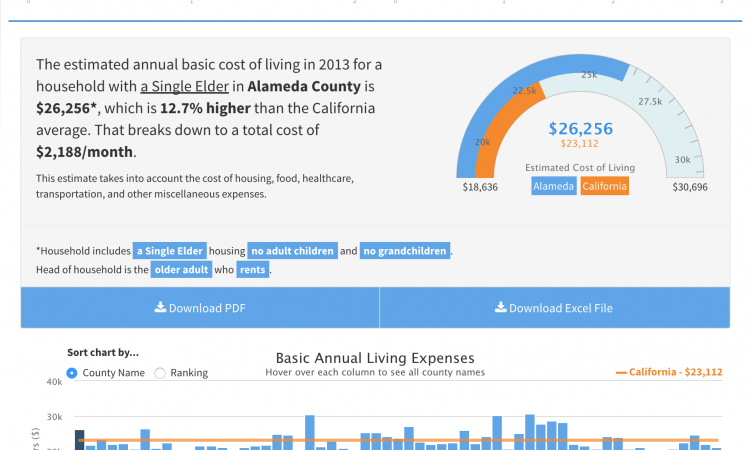 By leveraging R, Shiny, Shiny Server, MySQL, and a plethora of data visualization packages, I developed an interactive dashboard that presents cost-of-living information in intuitive and user-friendly ways. The dashboard uses a variety of R packages, from data viz packages (leaflet, highcharter, DT), to data manipulation packages (plyr, dplyr, tidyr), and unix applications to dynamically create and serve PDF reports to users. The dashboard is freely available here. The UCLA Center for Health Policy Research, which runs the California Health Interview Survey (CHIS), developed granular health estimates at zip code and city level, primarily used in the AskCHIS NE application. 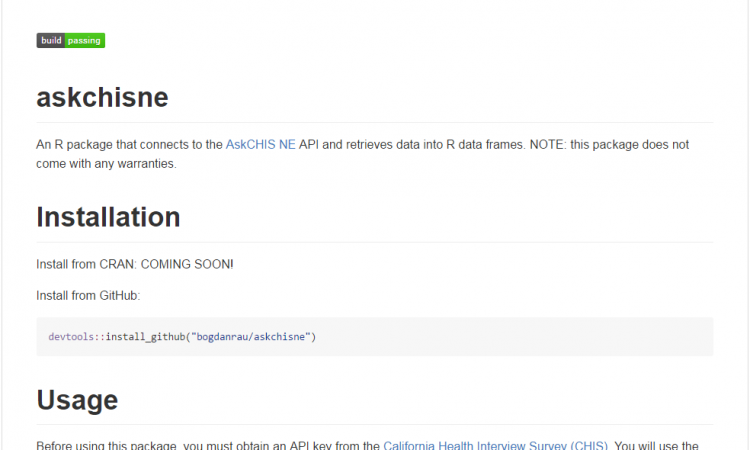 By using the Center’s deployed API infrastructure for AskCHIS NE, I developed an R package that allows data scientists & data analysts to connect to the NE API, and bring in granular health data directly into the R workflow. The package uses httr, plyr, and stringi to perform a variety of functions and data frame manipulations, resulting in a cleanly structured and nicely formatted data frame. Users can request estimates by location, or for all locations within a specific geoLevel. The package is freely available for download here. 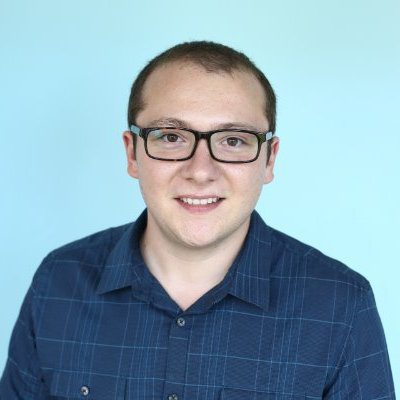 Use the devtools::install_github() function in R to install it. An API key is required. Contact CHIS at askchis@ucla.edu for information on purchasing an API key.